Nearly half of all chameleons live in Madagascar. The Meller’s chameleon is the largest chameleon not native to the island nation, and the largest chameleon living in mainland Africa. Meller’s chameleons inhabit the east African savannas of Malawi, Mozambique and Tanzania. These lizards are also found in bushland trees and throughout tropical grasslands. Meller’s chameleons grow to around 21 inches long and weigh about 14 ounces. They are easily identified by the small horn that extends from their snout, giving rise to their other common name, the giant one-horned chameleon. Like all chameleons, Meller’s chameleons have the ability to change color in response to stress or as a form of communication. Contrary to popular belief, they do not change colors to camouflage themselves. At rest, Meller’s chameleons have dark green skin with yellow stripes and random black blotches. The carnivorous Meller’s chameleon is solitary by nature and a fairly slow-moving lizard, so it doesn’t chase after its prey. Rather, the chameleon hides itself in the foliage, waiting to ambush its prey. When an unsuspecting insect or small bird moves within the Meller’s chameleon's target range, it shoots out its tongue, which can be up to 20 inches long, captures the animal and eats it. 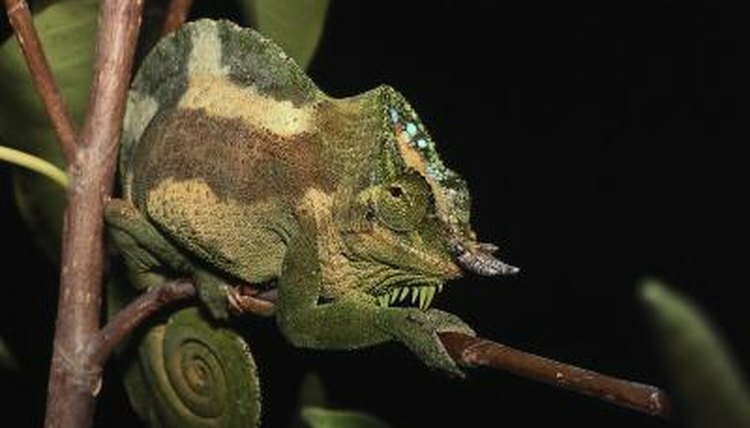 Other smaller lizards may also be targeted by Meller’s chameleons. Each chameleon species changes color according to a unique code of communication that relays information about the animal’s mood, health, reproductive status and submission or aggression. The color cells of a chameleon's skin are activated by brain waves, and the chameleon creates particular color shades and patterns by tightening or flexing muscles to change the shape of the color cells. For example, during mating season male Meller’s chameleons attempt to attract females by turning red. In response, females turn yellow with black and cream splotches if receptive or black and gray if they’re not interested or have already mated. If a female Meller’s chameleon has indicated she is receptive to the male’s advances, they may mate several times over a period of days. Females can store sperm from a mating for several months, enabling them to lay several clutches of eggs during the year from a single encounter. Most clutches have between 50 and 90 eggs. The female buries the eggs in a hole in the ground, covers them and leaves. After four or five months the young Meller’s chameleons hatch from their eggs to fend for themselves. Adult Meller’s chameleons neither guide nor protect the hatchlings.